Several 16th-century records claim that the Beothuk were “tall” or ”of large stature,” but this seems not to have been the case. Reliable eyewitnesses said they were of “an ordinary middle size,” “broad-breasted” and with a “bold and upright posture.” Unusually tall persons would have been the exception. Several eyewitnesses claimed that the Beothuk were of a lighter colour than other native people; others said they looked very much like the Mi'kmaq. The Beothuk were said to have worn their hair “somewhat long” and straight; some of them had a strand of hair at the back of the head plaited and decorated with feathers; others seem to have worn it hanging down or had all of the hair plaited. The Beothuk were generally beardless, although Demasduit's husband, Chief Nonosabasut, was said to have had a bushy beard. As mentioned earlier, the Beothuk traditionally painted their faces and bodies with a mixture of red ochre and grease. When genuine ochre was not at hand, they used reddish soil with a high iron content that stains well. The ochre colour was a mark of tribal identity and the first coat, given to infants, was regarded as a sign of initiation. It also had a religious connotation. Under favourable circumstances, the Beothuk were said to have been ingenious, trustworthy and proud. On other occasions, they were considered to be aggressive and vengeful and ready to retaliate for the many wrongs they had suffered. Chief Nonosabasut was an exceptionally courageous man. When his wife had been taken by the settlers, he singlehandedly faced the armed men to demand her release - he paid with his life for his loyalty to his wife. Demasduit and Shanawdithit, the two women captives who stayed among the English for an extended period, were said to have been gentle, intelligent, affable and affectionate, but also proud. Shanawdithit easily took offence if she thought she had been slighted. 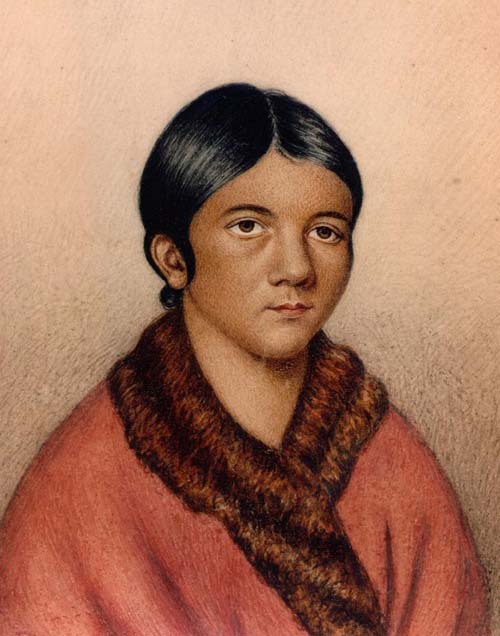 Of the several portraits of Beothuk women that have survived, only the miniature of Demasduit, painted by Lady Hamilton, is fully authenticated. It portrays her as an attractive and sensitive young woman with black eyes and short-cropped black hair. Two miniatures by William Gosse, which were based on this portrait, show a more stolid and mature person with a penetrating and reproachful look. It is believed that Gosse's miniatures portray Shanawdithit. The Beothuk made their clothing from animal skins. Some were tanned with the hair intact; others had the hair removed to produce supple leather. There are no reports of Beothuk using European blanket material for their garments or wearing European clothes. Because Beothuk coats had no proper sleeves - the Beothuk did not produce tailored clothes as did the Labrador Inuit - the arms (and possibly shoulders) would have been protected with separate arm covers, tied together under the outer robe across the back and front of the body, as was the custom among other native people. The Beothuk's winter outfit also included mittens. The Beothuk covered their lower torso with a loincloth. Although some contemporaries claimed that they went about "naked", most likely, by European standards, the native people were considered naked even if they wore a rudimentary item of clothing. In inclement weather the Beothuk wore leggings, which appear to have extended to the waist of the wearer, rather like pants. The legging that has survived was tied with thongs along the outside edge and had carved bone pendants and bird's feet attached. Since it was used as a burial shroud, the attachments may have been added for burial. Drawing by Ruth Holmes Whitehead. (1) vamp; (2) cuff; (3) sole. Footwear consisted of leg-skin boots and moccasins. Leg-skin boots were made from the hide of caribou shanks left in their cylindrical shape and sewn together at the lower end to form the toe part. 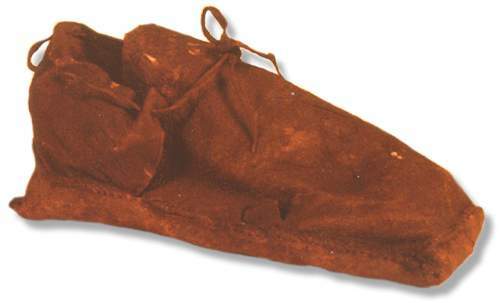 Moccasins, or ankle boots, were produced from three pieces of caribou leather that formed sole, vamp, and cuff. They were secured by a drawstring thong. Some boots had a finely fringed band sewn to the upper edge. A cone-shaped projection at the heel appears to be peculiar to the Beothuk design. For other related articles view the Aboriginal Peoples Table of Contents Beothuk section.